Childhood memories of stopping for cider along the road in the Okanagan. Thanks. Those sound like great memories. We used to have apple cider all the time when I was a kid, but I think that is more of a northern thing. Down south (at least in the U.S.) it is less common. This year we pressed our own…..continuing the memories. They are some of the most delightful and evocative labels I’ve seen. Thanks for sharing them. Yes, some of them are very cool. Those crate labels are superb–love the colors and graphics! A sure fire way to make me want apples, a crate with a serpent holding the fruit in his mouth – not! I think the reference to Genesis is a fail here. Great observation! I was wondering about why the snake image and had not picked up on the literary reference. I tracked them down through various sources. I think I saw a few from the Niagara area and many from other regions in the U.S.
😉 I was curious about the Niagara area since that is where I grew up. But it saddens me that a lot of the apple /peach orchards in the Okanagan Valley, B.C. 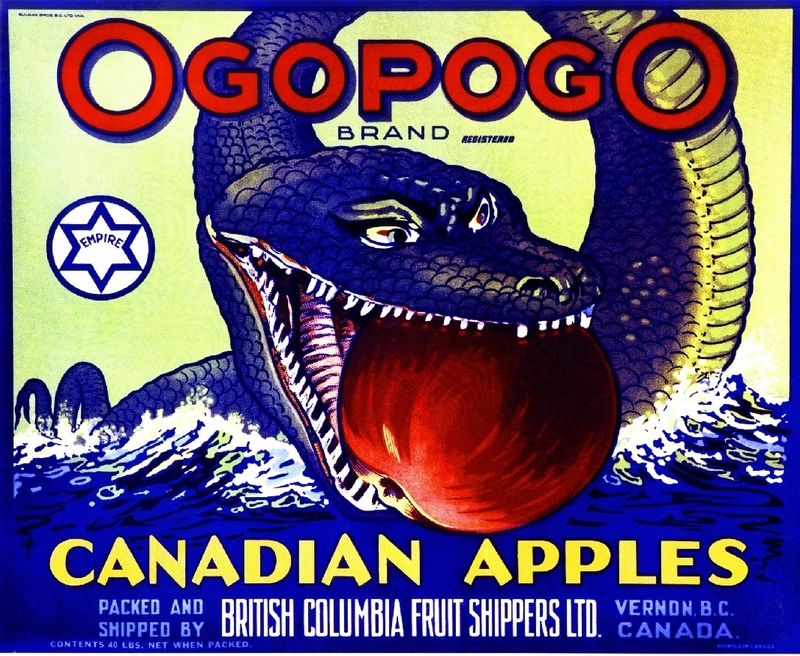 are gone and in place of more “cash” crops like vineyards for wines..
Ogopogo is the best: ancient tale. Jona, thanks. It’s interesting to observe how Canada is handling its difficult history with aboriginal peoples. Closest analogy seems to be the issues of racism in America and our own unfortunate history when it comes to native peoples here, full of mistakes and tragedy. As best I can tell, though, the Canadian people appear to be dealing with much of this head on, even recently issuing official apologies. Oh, that’s good to hear. I live in Europe so we don’t really have these kind of problems. Well, I live in Germany perhaps we can relate to that pretty good. I witness mostly ignorance on behalf of Americans regarding the genocide of native Americans. But well, not my cross to bear. Wonderful! I used to have some labels from U.S. growers out of Washington and Colorado. I’ve long been impressed by the effort that went into the designs. As for being offered an apple by a serpent–now, will that give me the wisdom of the gods? A lot of artistry in some of these designs, for sure. I think we’re on our own with the wisdom part. Love these bright and beautiful colors!! Where can we purchase these? Love them! Thanks — going to check out ebay. I’d love to reproduce them somehow into prints or cards. The colors are awesome and they are so different. BTW love your blog. I have traveled to Canada many times as a kid and an adult. Nova Scotia and Banff remain my favorite areas. Great up there. It would be great to do these up as posters. I wonder what the copyright situation would be. Christine, I agree — those would be cool!